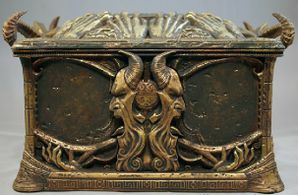 The Wonderbox is an odd and potentially very dangerous item, and is gained from completing the quest Find out who, what, when, where, why, and how. Find out who, what, when, where, why, and how is the first of two in a chain of mini-quests. It is rewarded with a Wonderbox and followed by Go there, do that, get the t-shirt. The hero will not encounter a boss. 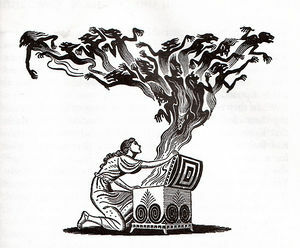 The Wonderbox stems from an old and malevolent evil. It was a gift to a Hero from the Norse God Loki who was notorious for shape-shifting and malicious sense of humor. The contents of the Wonderbox will vary greatly depending on the owners mood, happiness, length of beard stubble and general state of inebriation, which we established as 'the more the better' after some serious field trials, at least we think we remember that we established it. Known contents of the box have been gold coins, sharpened razors, bottles of non-alcoholic beer, whoopee cushions and great plagues of fire ants — so you can see the general idea. 07:22 Felt a burning desire to open the Wonderbox. Found inside something unbelievable — a scroll with instructions on how to get a premature level up! There are many possible outcomes of activating a Wonderbox[BB 1]. Nothing happening. If your hero has not completed their temple, the annoyed hero tries to break the Wonderbox with a golden brick resulting in the loss of the item and the golden brick. If the temple is complete, nothing happens but the loss of the artifact and expenditure of godpower. This page was last edited on 6 April 2019, at 12:46.